The National PurpleLight Vigil for Hope is a way for those of us affected by pancreatic cancer to make a bold statement about this disease. 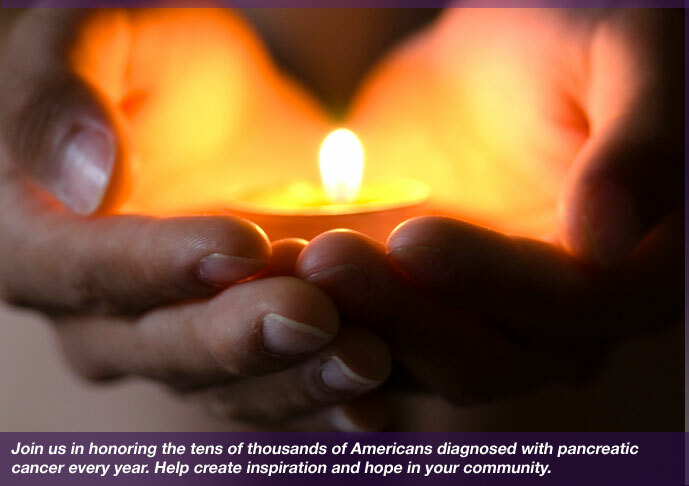 It is a way to shine the spotlight on pancreatic cancer and also commemorate the survivors and those we have lost. The PurpleLight Vigil is a night full of compassion, inspiration and hope. November has been designated as Pancreatic Cancer Awareness Month. And the signature color chosen for pancreatic cancer is purple. Pancreatic cancer is one of the deadliest cancers in our country. The average life expectancy after diagnosis is just 3 to 6 months. An estimated 74 percent will die within the first year. And only 6 percent of patients are still alive after 5 years. It is currently the fourth-leading cause of cancer deaths in the United States. These statistics, the dismal survival rate, and lack of early detection have not changed much in more than 40 years. Part of the reason that so little advancement has been made in the fight against pancreatic cancer is that just 2 percent of the National Cancer Institute’s federal research funding is allocated to pancreatic cancer research. That’s far too little for such an aggressive disease. I believe with all my heart that pancreatic cancer is the most underfunded, under recognized and least studied of all the major cancer types. That just has to change! Unfortunately, the best advocates for raising money and encouraging research are the survivors of this disease. And with so few survivors, the spotlight on pancreatic cancer shines very weakly. It is up to us, the family and friends who have lost a loved one from this disease, to step up and bridge the gap. We have it in us to make a bold statement to our communities everywhere. I know it has become our personal crusade. Mom is in the fight of her life, and she is not fighting alone. 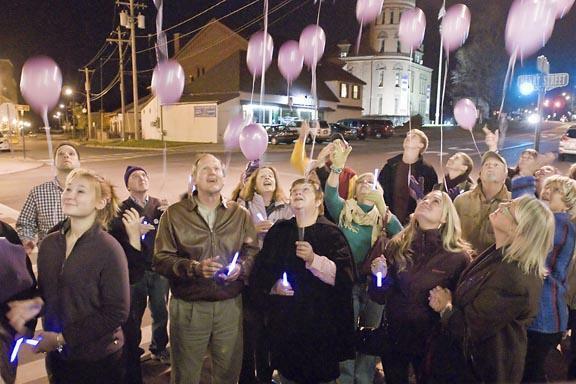 Pancreatic Cancer Action Network is the non-profit organization behind the Purple Light Vigil for Hope. They have chosen one night during the month of November to bring together pancreatic cancer patients and their supporters. People all over the country will gather to light purple glow sticks in memory of those who have died of pancreatic cancer and to celebrate the survivors of this relentless disease. It is a wonderful opportunity to raise community awareness about this disease. The PurpleLight Vigil is truly an inspiring, sobering event. At many of the Purple Light Vigils, there will be speakers to encourage us to not give up. It may be a pancreatic cancer survivor, a dedicated family member, or even a local congressman. There will be music, balloons and snacks. But most of all, there will be solidarity. A joining of hands and hearts to honor those touched by pancreatic cancer. We will be there. Join us.